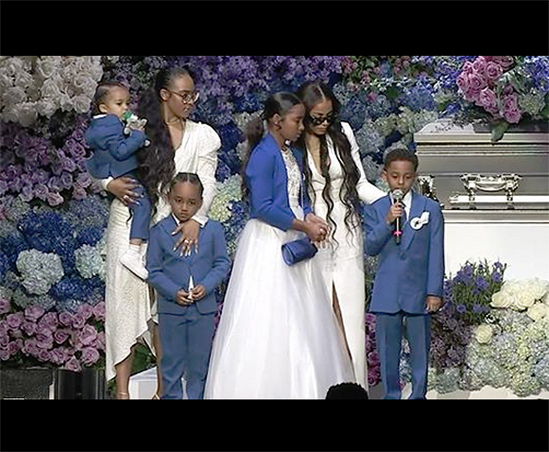 Superstar rapper Snoop Dogg, musician Stevie Wonder and former President Barack Obama were some of the several folks who paid tribute to rapper Nipsey Hustle, who was born Ermias Joseph Asghedom, today at the Staple Center in downtown Los Angeles and at a Celebration of Life service which was live-streamed by multiple news and entertainment outlets. Fans who were lucky enough to score tickets to the memorial service received glossy books containing 100 pages of photos documenting Nipsey’s life which contained messages from Snoop Dogg, LeBron James, The Game and Russell Westbrook. Nipsey’s friend and business partner Karen Civil read a touching letter from former President Barack Obama. “I’ve never met Nipsey, but I’ve heard his music through my daughters, and after his passing, I had the chance to learn more about his transformation and his community work,” the letter read. 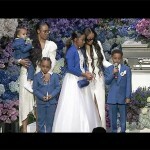 Actress Lauren London who shares a young son with the rapper also took to the microphone to share her love of Nipsey Hussle. London included Los Angeles residents in her thoughts of Hussle who she called “majestic” because of how much he meant to the city. Jhené Aiko, Marsha Ambrosius and Anthony Hamilton also performed at the service which kicked off with a DJ and a live band in a musical tribute.